Opocrin S.p.A. firmly believes that ethics and environmental, social and economic sustainability in pursuing business purpose promote the long-term success of each company. In the awareness that a company is evaluated, other than for the quality of its products, also on the basis of its capacity to add value and create wealth for the community respecting ethical principles, Opocrin S.p.A. has constantly taken care about reaching an increasing Corporate Social Responsibility. For these reasons, Opocrin S.p.A. has adopted an Organizational, Management and Control Model and the Code of Ethics according to the Legislative Decree No. 231/2001 and has implemented a Quality System and a Health, Safety, Prevention of Major Accidents and Environment Management System, in compliance with cGMP, BS OHSAS 18001:2007, Legislative Decree No. 105/2015 and UNI EN ISO 14001:2015 standards. Opocrin S.p.A. hopes that all the stakeholders – employees, partners, community, etc. –comply and respect principles and rules of conduct identified by the company, pursuing social actions in accordance with ethics and legality. Opocrin S.p.A. is characterized by a strong value system that allowed it to costantly grow in the market acting pursuant to ethics and responsibility. 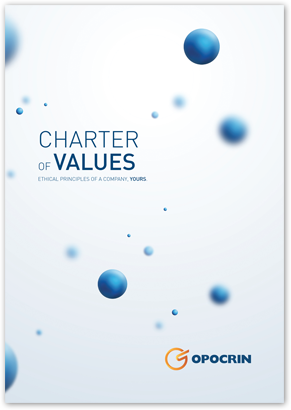 Honesty, transparency, integrity, membership, environmental and territory protection are only some of the principles and values set out in the Charter of Values and Code of Ethics, in which Opocrin S.p.A. identify itself and that any stakeholders have to abide by them. In compliance with the provisions set forth in the Legislative Decree No. 231/2001 on “Discipline of the administrative liability of legal representation, companies and associations without legal representatives”, Opocrin S.p.A. has adopted its Organizational, Management and Control Model. The Company has appointed an independent Supervisory Body (ODV) in charge of monitoring the compliance with the provisions of such Model and Code of Ethics. Management Systems qualify as voluntary or mandatory tools functional for improving company’s processes and performance and representing a firm basis for proposals of sustainable development. In compliance with the highest quality standards necessary to operate in pharma industry, the whole Quality System of Opocrin S.p.A. abides by cGMP (current Good Manufacturing Practices). The Company has also obtained the BS OHSAS 18001:2007 certification relating to its Health and Safety on workplace Management System (SGS) and adapted it to Legislative Decree No. 105/2015 on Prevention of Major Accidents, if applicable.